Pharmacists are usually keenly aware of the important role their staff play in helping them provide excellent care for their patients. But sometimes pharmacy staff, such as delivery drivers, might need a reminder of their own worth – now more than ever, when the valued services they provide are under threat. 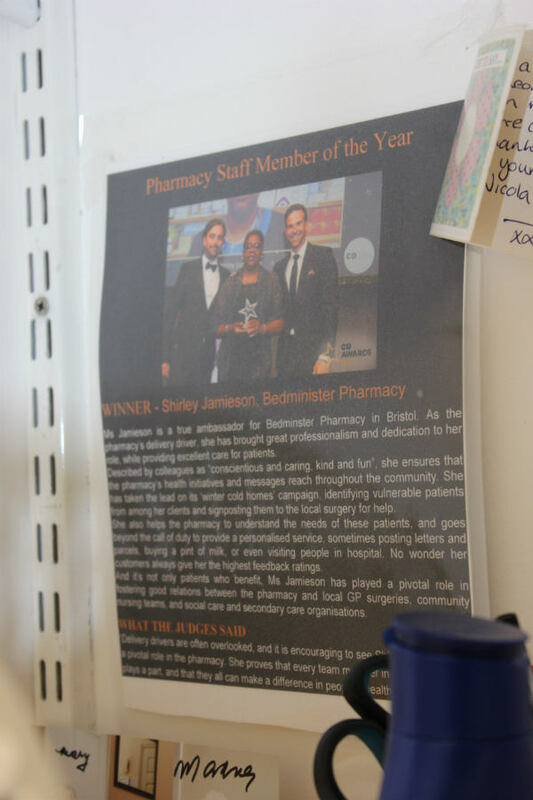 So I shadowed Shirley Jamieson, delivery driver at Bedminster Pharmacy in Bristol and winner of last year's Pharmacy Staff Member of the Year C+D Award, to find out the impact she makes to her team, and their patients. 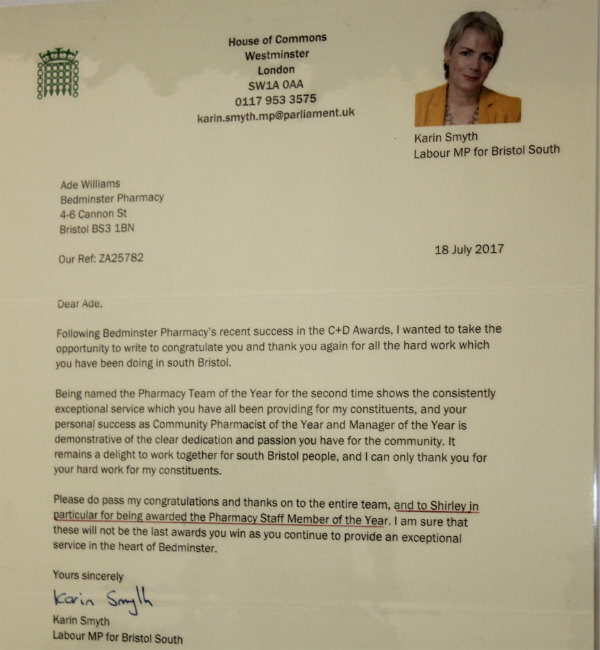 On our way out of the pharmacy to make the deliveries, I notice a letter from Karin Smyth, Labour MP for Bristol South and shadow deputy leader of the House of Commons, who made a point of singling Ms Jamieson out for praise while congratulating the Bedminster team on winning an impressive four C+D Awards in 2017. One of our stops on Ms Jamieson’s route is a local GP practice, where the receptionists know her by name and greet her warmly. 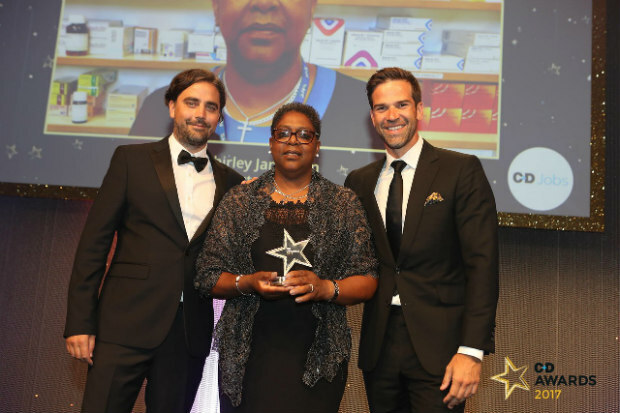 It's easy to see why the C+D Awards judges commended Ms Jamieson for playing a “pivotal role in fostering good relations between the pharmacy and local GP surgeries, community nursing teams, and social care and secondary care organisations”. When we visit the Monica Wells House 'urban retirement village' – a complex of 121 retirement homes – I see what Mr Williams calls the “link” Ms Jamieson provides between the pharmacy and their patients in action. Ms Jamieson is well known, and extremely popular among the staff at Monica Wells House. Before making her deliveries, she helps them resolve an issue concerning medicines for a patient who is in hospital. “Shirley’s always very kind,” says one resident after chatting at length with Ms Jamieson, who remembers to ask how the patient’s granddaughter is getting on at university. This is poignantly brought home by another letter I spot back at the pharmacy – from a patient thanking Ms Jamieson for the “outstanding service” she provided to the patient's mother, before she died. Is there a staff member in your pharmacy who really makes the team tick? The C+D Awards is an opportunity to show how important they are. Entries for all 13 categories are now open, so find out more here. Pharmacy delivery drivers: unsung heroes under threat? Will you be entering the C+D Awards this year?